The double-wall pipeline is sloped during the installation to ensure its contents will drain back into the storage tank. So we could install a DLLS-1 double-wall pipeline leak sensor which connects the lowest point of the interstitial space of the double-wall pipeline with a fuel collecting tube. 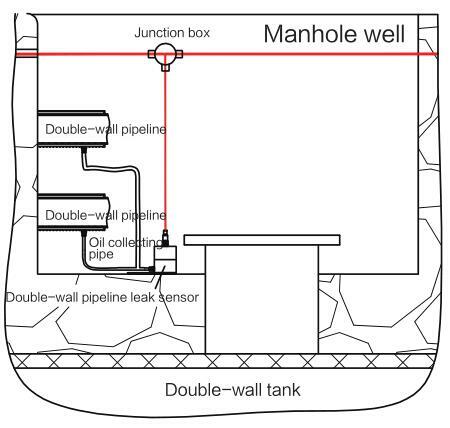 If any leak happened in the pipe, the liquid in the interstitial space will flow to the lowest point of the pipe and then go through the fuel collecting pipe to the container of the DLLS-1 double-wall pipe leak sensor. When the sensor detects liquid, then an alarm will be activated.